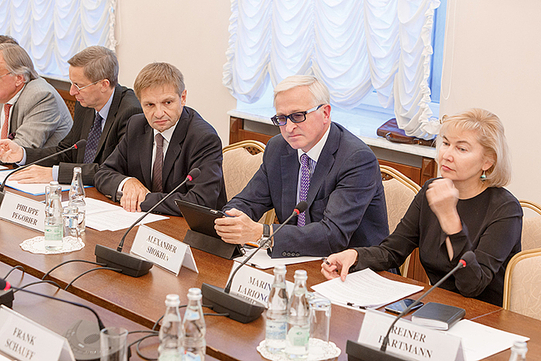 The International Council for Cooperation and Investment (ICCI) met at the Russian Union of Industrialists and Entrepreneurs (RSPP) on September 16, 2014. ICCI is an advisory body established by the RSPP in 2008 to provide a platform for a dialogue of foreign business and Russian state authorities. Representatives of more than 40 leading companies and business associations from the European Union member-countries, Canada, China, India, Japan, Turkey, US and Russia discussed business positions on the crisis in Ukraine and the consequences of sanctions and counter-sanctions. Members of the ICCI expressed their deep concern about the loss of lives in Ukraine and the deteriorating political situation in Europe. The participants welcomed the ceasefire and urged all parties concerned to take immediate steps towards a peaceful resolution of the conflict. ICCI Statement highlights the damage caused by restrictive measures and calls for avoiding and rolling-back of mutual sanctions. According to the expert estimates the Russian economy may lose EUR 23 billion this year and EUR 75 billion in 2015. The EU is expected to lose EUR 40 billion and EUR 50 billion respectively, which will negatively affect the world economy and global growth. The ICCI members expressed confidence that all fora and public platforms should be used to resolve the current situation and to put an end to the violence in Ukraine. Foreign companies active on the Russian market and their Russian partners reaffirmed the willingness to continue their cooperation that had proven to be beneficial for all participants over the past decades. They also called on their governments to continue working together with the business community on improving the investment climate and restoring confidence.